This edition features info on our online Member's Area, a profile of Jane Osborne and our monthly advocacy challenge. 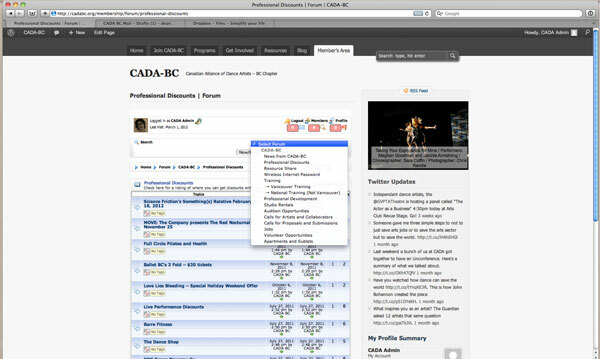 Comprised of an interactive Forum and Events calendar, the Member's Area is the place for CADA/BC Members and Staff to post and read announcements about projects, shows, classes, workshops, auditions; put out calls for collaborators, volunteers, submissions; share resources; start discussions; find out what’s going on in your community and share what you are up to. Members have been emailed their username and password (most likely the first letter of your first name, followed directly by your last name; your password is 'password' til you input one). Click this link for instructions on access and use. 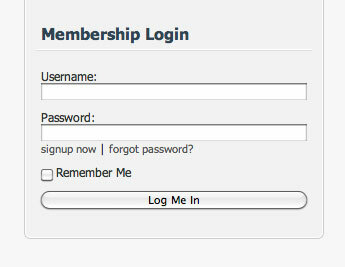 To start exploring straight away, find the Membership Login section on the cadabc.org homepage. What hats do you wear in your dance career? I am an interpreter in the work of other artists, I teach both contemporary dance and ballet and I am currently working as an Apprentice Pilates Instructor as I study towards my certification. I am a co-director of the collective The Contingency Plan. We commission, create and produce new works of live theatre. I do administration for the collective and myself. I also sit on the board of the Training Society of Vancouver. I really love dance for the camera and, since making my first film years ago, I can't well say that I wear the hat of an independent creator/director, but I continue to horde ideas in my notebook and I hope to play with a camera again soon. Sometimes I don a tie and apron and serve people food, but I try not to do this too, too often. As an interpreter of others' work in dance and dance theatre, what projects are you currently engaged in? I just finished understudying for the 605 Collective. It was so great being in the room with them and getting to jump in. I enjoy the challenge of understudying where at times you need to fly by the seat of your pants and learn quickly. When in doubt...run out of the way. I am also working with Conrad Alexandrowicz—another fantastic challenge. The cast is comprised of two incredible actors and myself. It's inspiring to work and play with artists from different disciplines in an ensemble setting. The Contingency Plan is getting ready for the Dancing on the Edge Festival. I will be performing in Vanessa Goodman's new work. Where did you do your pre-professional dance training? What aspects of this training do you see yourself going back to? For me, it laid my framework of understanding for contemporary dance. I had had very little experience with the form prior to attending SFU, so the training I received there became the foundation upon which I have layered all future learning. I learned a great deal about myself as a mover, creator and teacher at SFU. So, perhaps it is less about going back to things and more about aspects of the training that are now a part of me—that I carry with me and continue to build upon. How are you building upon these experiences in your professional practice? My experiences at SFU became my framework for my ongoing education in contemporary dance aesthetics. Since graduating, I have continued to train by taking classes and workshops—becoming increasingly specific with my ongoing interests and seeking out opportunities to study these techniques, methods and genres. Several years after my graduation, The Contingency Plan was formed by myself and two other grads, Vanessa Goodman and Leigha Wald. In my experience, collaboration was encouraged at SFU and, coincidently, I had worked with both Vanessa and Leigha while there. I think, in short, what I have taken from my pre-professional experiences, and find applicable in my professional life, is acknowledging the people who support me—embedding myself in a community that inspires and engages me, being curious and just working hard. What helps get you through a long day of dancing? Is there a website, accountant, printer, physio that you could not function without? Where did you get those wicked kneepads? Any good workshops coming up? ...through some means, share with us what keeps you in it, engaged and inspired.